Those who have ever suffered from headaches or migraines know that it can be extremely debilitating. Luckily, numerous herbs have medicinal properties that can naturally bring relief from these pesky discomforts. This DIY headache balm combines chamomile and lavender, both of which have sedative effects that promote relaxation and relieve tension. It also contains peppermint, which contains menthol that can ease the pressure and pain in the head. For headache sufferers and others alike, this herbal balm is a helpful addition to everyone's medicine cabinet. Start by creating a double boiler by placing a pot on the stove, filling it half way through with water, and fitting a glass bowl on top of the pot so that its bottom does not touch the water. Transfer the mixture into a glass jar and set aside to cool. Once cool and hard, place the lid on and store in a dry, cool place. 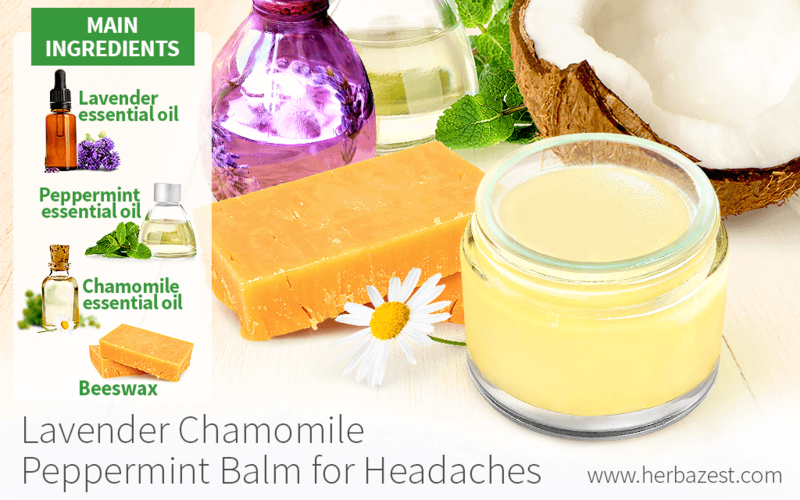 Apply this aromatic balm for headaches on the temples or forehead whenever you feel a headache or migraine are under way.